This sophisticated park bench with knockout inserts is ideal for any setting. The precast bench ends are constructed of an aggregate epoxy mixture that is very strong yet lightweight. The aggregate sides have a round knockout with three decorative insert options. 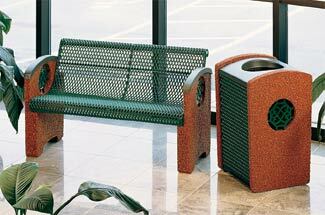 The thermoplastic coated metal seat is available in three metal pattern and three thermoplastic colors. 5 aggregate color choices complete the options. Some assembly required.